It didn't take very long for the CW's Supergirl to find its Superman. As reported previously, the Man of Steel was finally going to show his face in National City to his cousin Kara (Melissa Benoist), and the audience, this coming second season.Tyler Hoechlin (Teen Wolf) has been chosen to don the red cape, red boots, and red shorts (?) as Clark Kent/Superman. Hoechlin will appear in the first two episodes of Supergirl Season 2, in the same Monday night time slot it had while on CBS during season one. Up until now, Superman has only been glimpsed in obstructed ways, through solar flares, a shot of his boots, a hand, etc. He's communicated with Kara via messaging app which always seemed awkward when he could have just picked up the phone. Finally, we'll see another actor in full take on the iconic role. 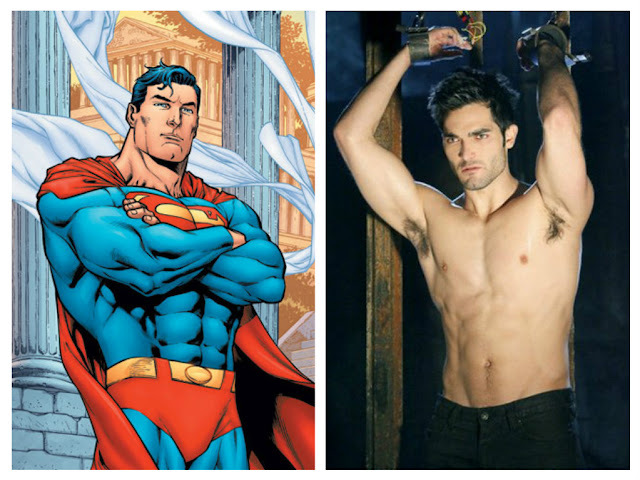 Hoechlin follows a long line of Supermen beginning with the current big screen version in Henry Cavill (Man of Steel, Batman V Superman: Dawn of Justice) Brandon Routh (Superman Returns, currently playing Ray Palmer/The Atom on CW's 'Legends of Tomorrow') and Christopher Reeve (Superman: The Movie and its sequels). There's just as long a list of thespians who've donned the "S" on television including George Reeves (The Adventures of Superman), Dean Cain (Lois & Clark, currently Supergirl‘s Jeremiah Danvers) and Tom Welling (Smallville). Aside from his work on the popular MTV supernatural thriller, Hoechlin has numerous TV credits including a run on 7th Heaven. He's fresh from Richard Linklater's latest feature film Everybody Wants Some!! Some websites had him on their wishlist of actors to fill the role and with good looks and a chiseled physique you can see why. Oh, he can act too. I sorta wish Tom Welling would have been picked. a lot of people wanted Welling but the show went younger. i think they'll have Welling on the show at some point. As who? I don't know.